Blow by Blow and Wired period Jeff Beck. Great news for those listeners who lean toward instrumental chops guided by solidly arranged tunes , the kind of jamming that didn't forget the register jumping lessons of Coltrane of having each phase of a solo remain a fast but contiguous with the phrase before it and the one that would follow, and Ellington, you bet, who was the master of composing songs for select soloists (especially for his saxophonist Johnny Hodges) that highlighted a musician's instrumental personality. Effortless, layered, compositional nuance and transcendent and inspired ad lib from the soloists elaborating on the foundations. City Blog, though, is a mixed bag, a situation where technically and at times riveting demonstrations of technique gets snared by the tepid go of substandard songs. The problem isn't the skill of the musicians , who have a collective resumes that includes stints with Herbie Hancock, Steely Dan, John Scofield and many other notables. 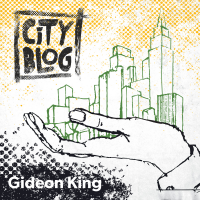 City Blog's pedigree is impressive and solo with seamless fury end to end, especially in the guitar work of Gideon King. What he offers here is work that seems to announce the next Guitar Hero; in keeping with this acknowledged debt to Steely Dan as an influence, his tone is snaking and sleek , slow to build over the suspended chords with unexpected twists and inversions, consistently constructing solos from brief initial statements to middle sections that provide exhilarating crescendos , fast, precise, stinging, and skillfully tapering off artfully, returning to the main themes. Same for keyboardist Kevin Hays, a versatile member who cross references funk, bebop, the angular logic of Monk and the sweetly insinuating vibe of Stevie Wonder; he's adroit, imaginative, full of surprise,a musician who thinks fast on his feet, in a manner of speaking. The material , though, isn't as impressive as it should be. Where the kind of fusion jazz this band seems to be trying to revive would , generally throw off the tasteful ballads and tone poems and kick an album or a live gig up a few notches and allow the soloists to rage at accelerated tempos over tricky changes, City Blog's material remains long in the middle area where pace is groovy and casual at first, but after several iterations becomes repetitive sing-songy. You get the feeling of being the last bit of cola being swished side to side in the can, at a mechanical , mind-numbing consistency. Also , the material lacks graspable hooks, those musical figures that catch your ear and lure through a great song's melodic invention and the musician's contribution to the whole. This a matter of having the band member skills framed , a context challenging already skilled players to do even better work. The music here too often becomes a meandering fog , with tones, textures and hints of other styles failing to achieve cohesion. This is less a collection of original songs than it is a style sampler with the incidental benefit of skilled extemporizing. I appreciate the idea, as well, of bringing a day when it seemed that music could change the world for the better with a collective consensus that good vibes, peace and love can be achieved through songs that carry a message of dreamy utopianism. This is for old hippies , though, and the music of Steely Dan, however seductive and serene in its exotic otherness, had a poetic cynicism , an Imagist take on the world that dealt with the dilemma of human expectations, whether material or spiritual, coming into conflict with a reality that always harshed any dreamer's billowing mellowness. City Blog takes a different lyrical tact , which is understandable, but it's unfortunate well worn tropes were the alternative to Dan's crafted poetics. For those looking for solid solos, chops, fleet and frantic improvisations that generate a good amount of heat, there is more than enough to satisfy here. For the rest, it's a drag exceptional talent gets weighted by songs that don't leave a lasting impression. I am singing riffs from the instrumental bridges, not the hooks from the songs, and that is only half the pleasure I would have preferred to have received.